These beautiful Ukrainian canvas bags are unique pieces, hand decorated with varying silk floral designs. All bags are lined, with inner pockets, a zip closure, a back zip pocket and canvas or braided rope straps. 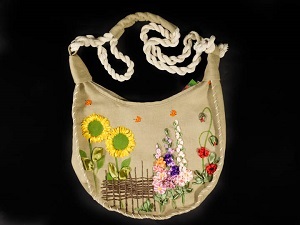 All handwork done in Ukraine on imported bags.